Tone Software Corporation, a leading provider of comprehensive unified communications and collaboration (UC&C) monitoring and management software announces ReliaTel Release 5.2.0 with expanded Avaya monitoring, new Cisco dashboard features, additional Nortel reporting, and performance enhancements for the Visual360 management portal. Using the new ReliaTel 5.2.0 capabilities, users have deeper visibility into Avaya Trunk Group utilization, additional dashboard views to rapidly identify and intercept performance degradation, and expanded insight into Cisco CUCM Route Group utilization to better optimize Cisco UC operations. ReliaTel 5.2.0 expands Avaya Aura Trunk Group monitoring, including full threshold analysis and automated notification via the ReliaTel Alarm List when trunk group performance becomes degraded and falls below the pre-determined thresholds. The new release provides a dedicated Avaya class to collect trunk group status data, and users can set custom polling intervals by trunk group to manage the monitoring frequency of specific groups. As a result, UC operations teams have closer oversight for high-utilization trunk groups, and better control of Avaya Aura trunk resources. 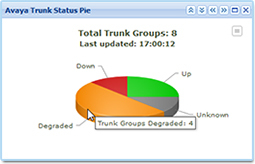 Avaya Trunk Group Status Pie Chart to present the overall status of monitored trunk groups in chart format, tracking the number of trunk groups in each performance category. Avaya Trunk Group Status Trend Chart to evaluate the performance of each trunk group in 10 minute segments, providing near-real time updates for each. Avaya Trunk Group Status Details showing utilization and performance details for each trunk group. Avaya Status Summary to summarize the status of monitored Avaya devices and trunk groups at a glance. ReliaTel 5.2.0 Performance Dashboards now provide additional views for Cisco CUCM Route Group Simultaneous Utilization, with metrics calculated using the Simultaneous method. The new view displays the top 10 utilized CUCM route groups, and includes metrics by percent of total capacity, as well as metrics attributable to inbound, outbound, and intra-route group traffic. Users can select the time period for display, ranging from today to last month. 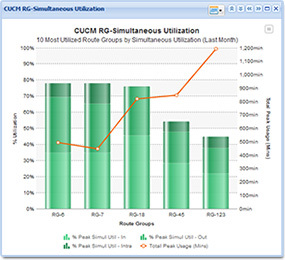 The new Simultaneous Utilization view is a companion to the previously provided CUCM Route Group-Cisco Utilization view, which calculates utilization using the Cisco method. ReliaTel 5.2.0 now includes a Dashboard view to track alarm response activity by user. Response statistics cover the number of alarms each user acknowledges and clears and the average time it takes a user to acknowledge new alarms and clear acknowledged alarms. 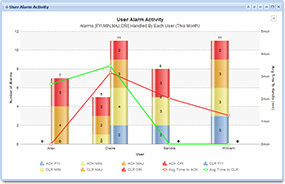 An added enhancement is the option to drill down from the User Alarm Activity view to a detailed, user-centric analysis of acknowledged and cleared alarms. ReliaTel 5.2.0 includes enhancements to the Visual360 graphical UC management portal to deliver faster interface response times in large complex communications environments. The new performance enhancements also make more efficient use of the ReliaTel database for Visual360 displays. Further, the new 5.2.0 release provides administrative interfaces for Avaya PBXs and Cisco CUCM devices to automate port count collection for more convenient monthly tracking. ReliaTel 5.2.0 also delivers Nortel Reporting enhancements, now enabling users to filter Nortel Route reports and charts by one or more routes to focus results on the preferred data. The ReliaTel 5.2.0 release is available immediately to licensed users currently on ReliaTel product maintenance. Contact Tone Technical Services to schedule your ReliaTel release upgrade today. Send an email to support@tonesoft.com or call 714-991-9460 and select option 1. Tone Software Corporation is a global provider of comprehensive monitoring and management solutions for advanced communications and collaboration ecosystems. Tone’s ReliaTel provides managed service providers (MSPs), UC as a Service providers (UCaaS), value added resellers (VARs), and enterprises with a unified approach for managing and monitoring their entire communications and collaboration environment, supporting the industry’s leading devices, networks, and applications from multiple vendors on multiple platforms. By unifying multi-vendor UC, SIP, and collaboration management in one solution, ReliaTel provides the ideal platform for organizations to cost effectively manage the quality, capacity, and service levels of the critical communications and collaboration systems that drive their business. Follow Tone on Facebook or Twitter.